If you were to ask your kids who their favorite superheroes are, what would their answer be? For my kids I guarantee Spider-Man would be in the top three! It's been a few years since my daughter received a Spidey lunch and my oldest son has never been given one. I figured it was about time for them to get their friendly neighborhood Spider-Man during lunchtime at school! This lunch was actually pretty easy to make. It's just a Spider-Man sandwich, some Babybel cheese, and a black olive spider. The most time consuming part was cutting the strawberries to fit together like a puzzle. However, after I did the first one for my daughter, the second one for my son was a snap. I made this lunch in an Easy Lunch Boxes container. Scroll down for the recipe! Also, if you use my Loot Crate link and coupon code by 11/19/18 you get 10% off your order. Just CLICK HERE and use code: lunchboxdad. This will get you an incredible box filled with Spider-Man, Bioshock, and Westworld themed gear and collectibles! Ingredients: 2 slices whole wheat bread, jam, nut-free spread, strawberries, nori, sliced white cheese, black olives, cream cheese, crackers, dried cranberries, Babybel cheese. 1. Make a jam sandwich with whole wheat bread. Make sure to put the nut-free spread on top of the sandwich. Slice strawberries into the shapes shown to make Spider-Man's face. The spread on top of the sandwich will hold them in place. 2. 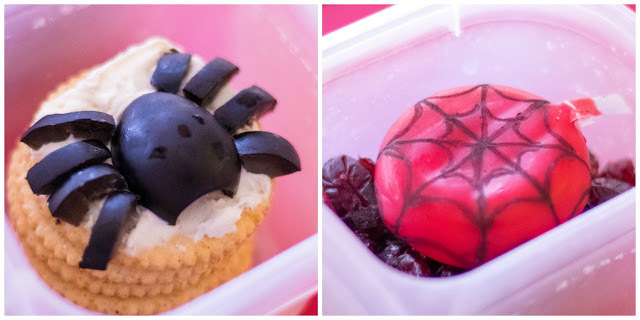 Cut white cheese and nori into eye shapes and place them on top of Spider-Man's head. 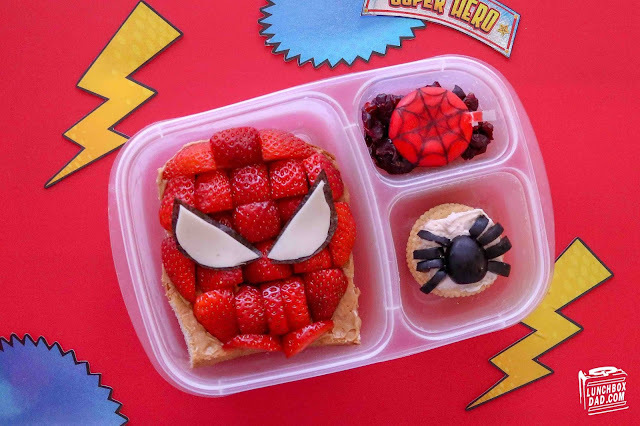 Put the Spidey sandwich into main compartment of lunchbox. 3. Drop dried cranberries into side compartment. Draw spiderweb on Babybel cheese using marker. Place that on top of cranberries. 4. Cut black olive in half and then slice up another olive to make eight legs. Spread cream cheese on your child's favorite cracker and arrange spider pieces on top. Stack more crackers in side compartment and top with spider cracker. This post contains affiliate links which means I get a small cut when you make a purchase using my link.